Reflections from a Washington insider. 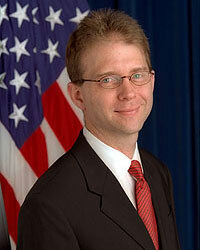 Jay Lefkowitz served in the White House administration of both Bush Senior and Bush Junior. And now, as the country transitions to an Obama presidency, Aish.com visited with Jay Lefkowitz on a recent Friday afternoon. Born in 1962, Jay was raised in Albany, New York, by American parents who were such ardent Zionists that his father spoke to him only in Hebrew when he was young. Jay attended Jewish day schools and Jewish camps and finished his high school education with a program at Israel's Bar-Ilan University. He has returned to Israel more than twenty times as an adult, and worked for a couple of summers as a tour guide for American high school students traveling on programs in Israel. Influenced by his parents and his passions, Jay always had an interest in public service. Through his undergraduate years at Columbia and during his time at the law school there, Lefkowitz was very involved in pro-Israel activities on campus and in the Soviet Jewry movement, even traveling to the former Soviet Union to work with refusenicks before the Iron Curtain fell. Upon graduation, he joined the Paul Weiss law firm and came into contact with Morris Abram, a senior partner in the firm and head of the President's Conference of Major Jewish Organizations. Mr. Abrams was also a vocal advocate for the rights of Soviet Jews and Jay worked closely with him on all of his public Jewish activities, often serving as Abram's speechwriter. This was Jay's entrée into the world of politics and international affairs. In 1991, he married Elena, a journalist who as since become a documentary film producer (they now have three children) and they moved to Washington DC. While they looked forward to the political opportunities on the horizon, they saw the move as temporary; they wanted to raise their children in the New York Jewish community, close to their grandparents. Jay became a junior domestic policy aide in the government of Bush One and when that administration ended, he joined his friend and colleague Bill Kristol at the Bradley Foundation, helping identify organizations that merited their support. In late 1993, Lefkowitz returned to the law and soon became a partner at Kirkland & Ellis, but always kept one foot in politics. While engaging in a variety of types of litigations, he wrote book reviews for the Wall Street Journal, articles for Commentary magazine, and defended the State of Wisconsin's school voucher program up to the Supreme Court. The Lefkowitzes were planning to move back to the New York in the fall of 2000, but the election of George W. Bush changed that. Jay was invited back to the White House to work as General Counsel in the Office of Management and Budget. Soon afterwards the President asked him to become Director of Domestic Policy in the White House. This proved to be an all-encompassing, all-consuming job. He needed to be in his West Wing office before 7 a.m. and frequently returned home past 9 p.m., after which he would spend many more hours answering emails. The job demanded 24/7 availability, but Lefkowitz didn't mind. He loved the work and kept the pressures in perspective. "The hard work that people do these days", he said, "is easy in comparison to the physical labor performed by previous generations." The White House has a more grueling schedule than any major law firm. Still, when you work for the President, your time is not your own. No matter what you're doing, he comes first. And so, one afternoon, when his wife was out of town, Jay found himself ambushed by a water attack from his kids just as he returned home. At that moment the phone rang. It was the President, requesting help with a speech he was delivering in one hour. Lefkowitz's immediate challenge was to stay just far enough ahead of his kids to 1) stay dry, 2) be able to hear the President, and 3) make sure the President didn't hear his children shouting wildly in the background. "Believe it or not," said Lefkowitz, "the grueling schedule at a major law firm is actually easier." Jay was in the White House on September 11. "The evacuation was calm, but everyone was conscious that the world had irrevocably changed," Jay says. "It changed the focus of my life, everything I was going to do." Jay had an extra concern on his mind. His children were in Jewish day schools; were they, G-d forbid, targets? At the White House, work continued the next day, even more intensely. One of Jay's first discussions with the President the following morning centered on how to compensate the firefighters and other rescue workers and their families, and how to begin going after the finances of the terrorist organizations. As much as Jay loved his work – and the opportunity to make a difference -- the time came to return to New York. Today, Jay is one of the managing partners and senior litigators at the law firm of Kirkland and Ellis. Still, over the past few years, the job offers from DC continued to come. Once, when Jay was tempted to return to the White House, he was brought down to earth by his then 12 -year-old daughter. "We don't want to move", she told him matter-of-factly, "so you'll just have to commute." Commuting is a difficult lifestyle for anyone, but as an observant Jew, Jay would have the additional factor of Shabbat observance. While Shabbat was never an issue at the White House, the early winter schedule did prove a challenge. However, everyone, including the President, was respectful, even allowing Jay to reschedule meetings away from Saturdays. Likewise, when Lefkowitz visited the ranch in Crawford and the Bushes were having Mexican food for dinner, Mrs. Bush went out of her way to make sure that Jay's kosher diet was accommodated. "A few weeks before the dinner, the First Lady's Chief of Staff called me over to consult on the menu and specific dietary needs of the invitees. Of the 130 potential guests, there were between 10 and 20 who kept kosher and would need special meals. Mrs. Bush was adamant that no one would have to eat differently and be forced to open plastic wrap. So she asked for some recommendations of kosher caterers, had some tastings, and then hired a reliable kosher caterer for the event." Mrs. Bush went out and purchased new china. "As the event neared -- perhaps it was even the morning of -- I got a call from one of the White House Ushers: 'What about the State china? We always use it for dinners in the State Dining Room?" I explained that unfortunately that would invalidate all their efforts. So Mrs. Bush decided that the White House would use brand new china for the dinner. This was the first and only time in history that a formal dinner was held in the State Dining Room without using the White House china. And this month, President and Mrs. Bush are hosting their 8th annual kosher Chanukah party in the White house. Jay's daughter Talia was the first person to ever light the Chanukah candles there. "I tried never to push my religious values, and I certainly never imposed them on anyone. I was playing a secular role, after all. But I am always conscious of the need to behave ethically and responsibly, and certainly all of my thoughts and actions are filtered through the lens of Torah and Jewish law." Although he refused all offers to return to Washington, Lefkowitz did accept the President's appointment to be the Special Envoy for Human Rights in North Korea. He felt that his experience with the Soviet Jewry movement would be instructive; he learned then that "human rights can be both a means and an end." As for the North Korean threat, Jay says: "North Korea remains one of the hardest foreign policy problems for the U.S. to solve. Its conduct does not appear to be that of a government that is willing to come in from the cold." Does Jay want his children to go into politics? "I want my children to have exciting and dynamic lives, lives that reflect a balance between their commitment to their family, their people, and the country they live in. The United States is unique in the wonderful opportunities it offers us to be of service." So as the Bush era draws to a close, does Lefkowitz have any advice for President-Elect Obama? "I believe his most important job, and any President's greatest challenge is to keep his eye on what's in the best interests of the country; that's not always the same as doing what is most popular or what will please the most people." Does Lefkowitz miss the excitement of the White House? "Of course I miss the daily interaction with the President and the camaraderie of the team, but I always knew it was temporary," he says. "It was a wonderful moment in time. And a wonderful opportunity to serve. Every morning as I entered the gates -- and the dogs sniffed my car -- I thought 'How fortunate am I, the grandchild of immigrants to be here, now'." I am happy to learn about President and Mrs. Bush and their respect for Jews, to help them keep kosher and observe Shabbat. I am proud of Jay Lefkowitz behaving with integrity to both his country and his religion. I am inspired by the letter writer Sherri to urge Mr. Lefkowitz to help get Jonathan Pollard released from prison, and to help the Jews of Yemen who are being murdered, kidnapped and otherwise persecuted. See the article in Aish.com. Jay, you are a LIGHT unto THIS Nations president. ....and since you still have the President's ear, please help the Jewish people redeem our captive...... I speak of Jonathan Pollard...he has more than served his sentence. Help him get alittle of his life back, enough IS enough. !!!!! I know Jay & Elena. They are true mentches and care deeply about Israel & the Jewish community. Good article. Jay is obviously a man of great integrity in his character. It is often awkward, and perhaps embarrassing, to remain true to one's closely held values when they draw great attention to yourself, cause inconvenience to others or make you appear foolish in the eyes of others. President Bush is likewise a man of great character and integrity, and I regret that the American people are so fickle in their opinions. Thanks for the insight into White House life. Wow, not one word about the horrible injustice being done to Pollard and the incredible opportunity that he probably still has to get Bush's ear and grant clemency to him before he leaves office. Already in his 24th year of a life sentence (the median sentence for giving information to an ally is 2-4 years) even many of those involved in his incarceration are now admitting that he was railroaded and should be released. I can only hope his efforts are simply not being mentioned in this article, otherwise he will have been put, like Esther of Purim fame, in a position to save the Jewish people and wasted the opportunity that will happen through some other means, G*d Wiling, soon. What a great experience for the Lefkowitz family. This article also shows what I've always known. Bush may not do what's popular but does what's best for our country.He and his family have always shown great respect for other religions including Judaism. I am so proud of Jay. As Jews, no matter what, we must always adhere to our Torah values.